Sugar Free Style: Girl Scout cookie time! 'Tis the season...that time when America's favorite cookies arrive in the mail. We ordered six different boxes to help friends' kids, but now that they're here, staring me in the face, I'm regretting my decision just a bit. Unfortunately, the Girl Scouts got rid of the sugar-free cookies they used to carry. RIP, reduced fat Chocolate Chips and Daisy Go Rounds. So, how does one avoid this type of tasty temptation when trying to watch the waistline? 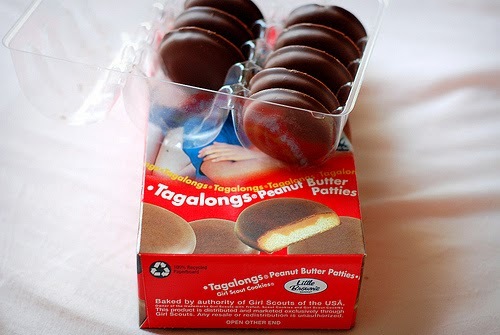 I brought two of the boxes to a friend's house - including my favorite, Tagalongs, as I knew I'd eat the whole thing myself - stuck two in the freezer and brought a box of Samoas to work. Now there is just one, unfrozen box remaining...which is much more manageable. However, you better believe I enjoyed a bowl of sugar-free vanilla ice cream with some crumbled Trefoils last night. So flipping good!